DSSSB had released a recruitment notice to recruit candidates for the posts of Assistant Forman, Manager (Information Technology), Deputy Manager (Personnel), Manager (Mechanical) and Deputy Manager (Traffic) for Delhi Transport Corporation (DTC) in the state of Delhi. DSSSB DTC Tier 1 Admit Card 2017 has been released by the Delhi Subordinate Services Selection Board (DSSSB) on its official website - dsssbonline.nic.in. How to Download DSSSB DTC Tier 1 Admit Card 2017? The DSSSB DTC Tier 1 Exam 2017 timing is 10:30AM – 12:30PM. Candidates must carry their e-admit card to the examination centre along with an original identity proof and take a photocopy of the same. Prefer to carry your Aadhaar Card, PAN Card or Voters ID card and its copy. The same needs to be furnished and submitted at the examination centre. Candidates must reach the exam center at least 15-30 minutes before the exam time to avoid last minute hassles. 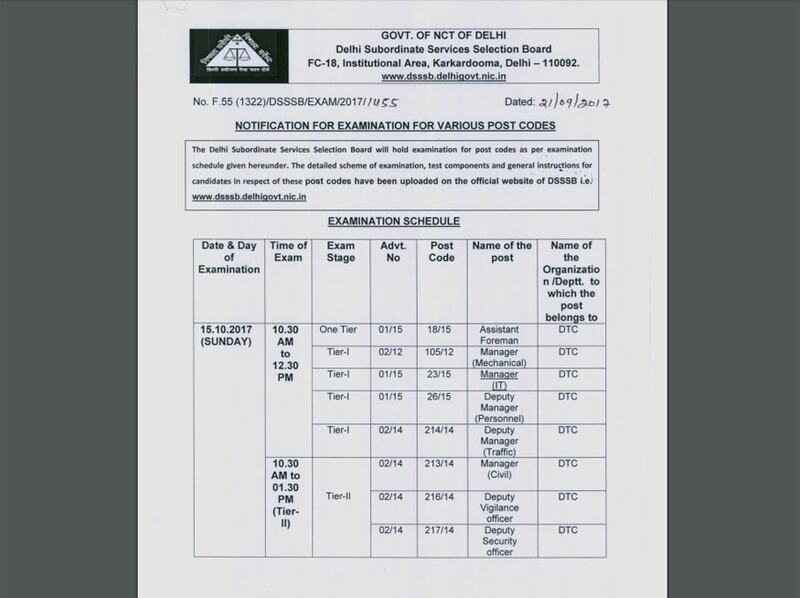 The Delhi Subordinate Services Selection Board (DSSSB) had released an advertisement where it had invited applications for the recruitment of Assistant Foreman, Manager (Information Technology), Deputy Manager (Personnel), Manager (Mechanical) and Deputy Manager (Traffic) in DTC – Delhi Transport Corporation. Candidates who will clear the DSSSB DTC Tier 1 2017 exam will qualify for the next round i.e. Tier 2 exam which will be followed by interview for final selection.